Proposals submitted by Crossrail to Hillingdon Council for a new station at Hayes & Harlington have been given the green light. 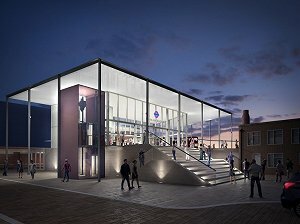 The plans will see the station given a radical overhaul with a distinctive glass and steel structure to create a local landmark. The new station will be built north of the existing station, replacing a property on site which is currently used for commercial purposes. The station will be run by Transport for London from the end of 2017 onwards. Designed by Bennetts Associates, the new station will be fitted with a bright and spacious new ticket hall, new lighting, new customer information screens and signage, platform extensions, a new footbridge with step-free access to every platform, a new waiting room on platforms 4 and 5 and dedicated help points. Proposals are also being worked on for the immediate area around the station, such as improvements to the public space in Station Approach, improved cycle connectivity to the station with continuous cycle lanes and safer pedestrian crossings. Councillor Douglas Mills, Cabinet Member for Community, Commerce and Regeneration at Hillingdon Council, said: "I’m delighted that the application for the Crossrail station in Hayes has been approved by the council’s planning committee as this will be a once-in-a-lifetime opportunity to create an impressive and welcoming gateway in the town. "I am also pleased that Crossrail have agreed to incorporate some of the original materials from the historic station into the new design. "We hope that Crossrail will take pride in delivering the station to the quality that Hayes deserves and look forward to working with Crossrail to maximise the benefits of the new stations for residents and businesses." Work on the station will commence in Spring 2015 and will run for approximately 18 months. When Crossrail fully pens in 2019, Hayes & Harlington station will be serviced by up to ten trains per hour in each direction. Journey times to Canary Wharf will be 17 minutes quicker, and the journey into Bond Street will be reduced by 15 minutes.